Next to the bottom deal I probably use the Greek deal the most, though it is fairly close to the second deal depending on application. Mind you, I also most frequently use the variation I'll describe later under "the Count's grip", which is incredibly easy to the point where I doubt if you'll even invest the time in learning the methods I describe here once you learn it. Essentially, I feel a Greek deal simply offers a nice convincing alternative to bottom dealing and I began resorting to one when I was playing poker with a couple friends whom I had explained bottom dealing to. The problem was, once they knew about bottom dealing they'd ask to see the bottom card of the deck before I dealt, which was naturally a problem if the bottom card would change later one (plus the ace of spades was usually a tip off). By Greek dealing, I could place a cover card on the bottom and eliminate suspicions. I later discovered that this offered another simple alternative without actually showing the bottom card I was able to "accidentally" flash the bottom card of the deck just prior to and just after dealing. I thereby demonstrated in a subtle manner that nothing had occurred in regard to the bottom of the deck while in fact dealing cards from the bottom of the deck rather than stacking. Acquiring this skill is also useful for any cases where you may find yourself confronted with a cover card on the bottom designed to prevent bottom dealing. Initially, I found the concept of bottom dealing difficult enough, the possibility of Greek dealing was unfathomable, it was simply so difficult to get past that bottom card and honestly, most Greek deals are extremely difficult to learn. 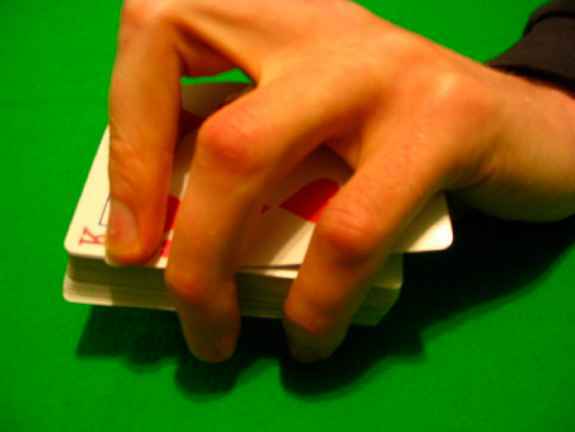 However, once I caught on to the idea of eliminating the bottom card I discovered numerous methods of performing this odd sleight, some with greater levels of success than others. 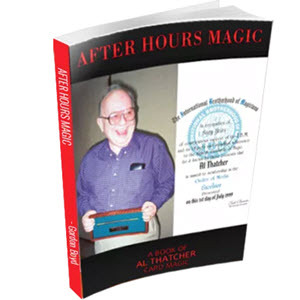 In this case, however, I'll describe not only the best methods, but some of the odd ideas I developed in order to acquaint you with the concept and hopefully inspire you to create your own techniques. 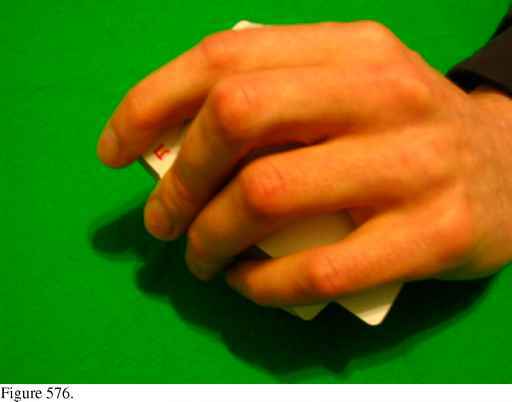 Performing a Greek deal by buckling the bottom card is probably the most used and simplest initial approach to the subject of Greek dealing. Just considering the issue initially, this was the concept I came up with, though I found some measure of difficulty when it came to execution. I'm sure just thinking about it now in the context of previous methods you have an idea of how you could go about performing such a deal, here then are a few examples in execution. Note, that all of them relate to previous bottom deals and thus you may find it an asset to refer to such bottom deals as we progress. 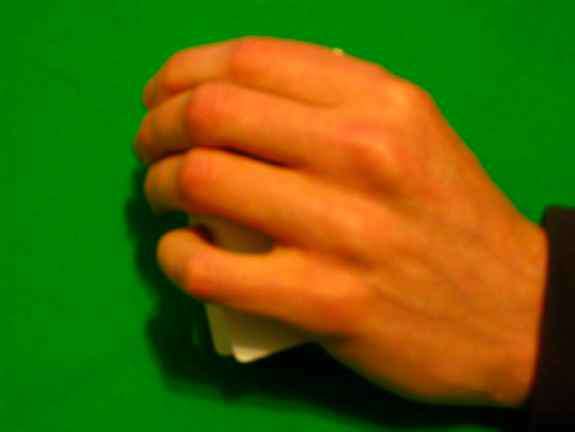 Based on the so called shifted grip found in the push-off bottom method one and strike bottom method one descriptions, however in the each case you must refer to the grip variation found under the push-off bottom regarding your middle finger position. It is possible to perform either a strike or push-off deal at this point, though I feel that from this particular grip the strike is somewhat unnatural and thus would recommend the push-off, which is somewhat of a contradiction since I dislike push-off bottoms from this grip. If you decide to perform strike Greeks from this grip you'll also need to alter your strike location somewhat, as such I'll offer an alternative based on the variation one grip which I prefer greatly. As I'm sure you are able to tell, this is less than the most elegant process, but it serves in introducing you to the concept. As you can easily tell, this action is subtle and exposes the corner of the card second from the bottom allowing you to perform your take based on that point. You'll find due to the buckle that there is diminished resistance and thus the take goes very well. There is a quick note for you to consider at this point. I didn't discuss sound in any detail when examining bottom deals because there was none, or no major discrepancies to speak of, the same is not true when examining Greek deals, here there is different resistance at work. Consequently, it is necessary to keep the potential differences in sound in mind. The ideas I examined earlier under the section on second deals naturally apply, but I find the simplest basic process with Greek dealing is simply to start by ensuring you perform the take in a level manner in order to minimize the amount the cards rub against one another. off. However, I feel this method is less deceptive than using your ring finger and thus that is what I shall explain. Again, as with the bottom deals, this is quite a deceptive deal when performed well, but I tend not to employ it often, largely due to the instability and prefer method one variation one for dealing Greeks. We now return to the beautiful push-off bottom method two handling. 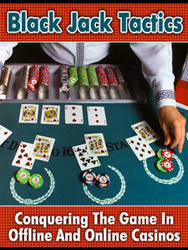 Practice of the bottom deal should have made you intimately familiar with the buckling technique in this deal, if not, I recommend you practice the bottom deal extensively before referring to the Greek handling. Our description begins just after the buckling of the bottom card in the push-off bottom handling for at this point it becomes necessary to push out the card second from bottom. While technically you are able to access the card in much the same manner as you accessed the bottom card, I find this process somewhat difficult and thus prefer a more reliable alternative. As a push-off Greek I think this is probably my preferred method, though of course you may make the decision for yourself. This is probably one of the simplest and most obvious methods of performing a Greek deal possible and yet I am completely unaware of anyone who employs this method, all the more reason I should take time to mention it I suppose. Basically the concept is this, you'll bottom palm the bottom card thereby leaving the card second from bottom exposed and allowing you to bottom deal with the effect of Greek dealing. 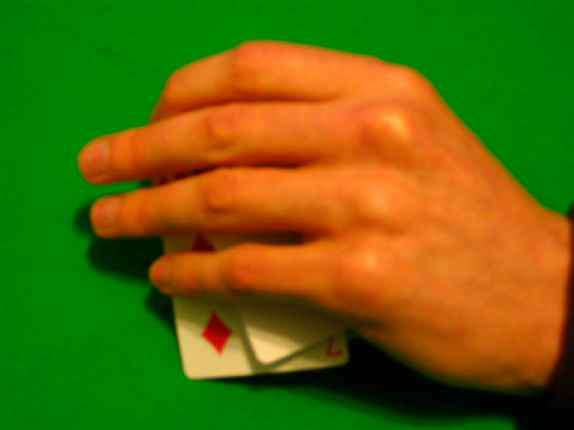 Now I'm not going to entertain the details of how to bottom palm a card, I use one of four methods that I'll describe in another piece of writing, the most common method is probably an Erdnase bottom palm which is taught all over for those who are interested. (Consult Expert at the Card Table for a certain source). Now, assuming you already have the bottom card palmed, I use the strike bottom method of dealing known as the cigar bottom deal, effectively strike bottom method one variation one plus universal variation two. I think once you master the bottom palm you'll find this works quite well and eliminates most of the hassles typically associated with Greek dealing. 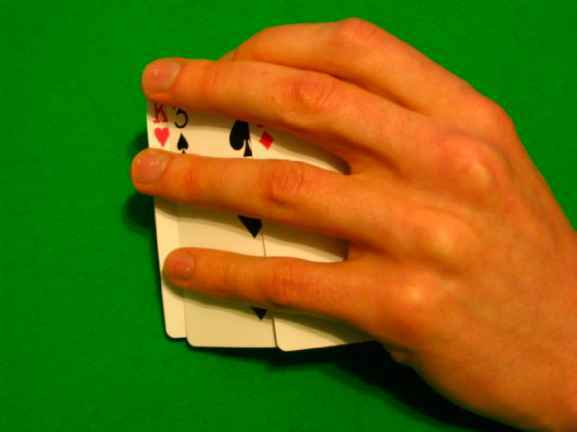 There is the minor concern of an audience member seeing the palmed card particularly from the right, but if you are mindful of this possibility and practice your bottom palm in such a manner that there is as little of the card visible as possible you should find yourself in good hands. I demonstrated this to someone once and he felt it was better than the buckle method when I performed it, personally I'm not so sure as the risk of detection seems gargantuan. Essentially, this deal uses the grip in strike bottom method one and method one variation one, which I shall employ here for the sake of example. Now this is surprisingly easy to do, but if you're having problems you may find it easier to buckle the card first and then catch the edge or to push the card right slightly and then catch the edge. Whatever you choose, as soon as your take finger on your right hand enters into that gap you'll return your middle finger to it's original position and move on with the deal as normal. Unfortunately, there are a number of potential tips off with this method that I haven't addressed effectively, but hopefully the concept will give you something to work with. 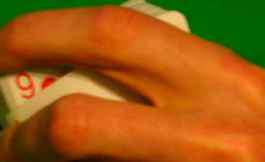 This method follows the same principle as the bottom palm Greek deal, but rather employing the complex bottom palm, it uses instead the simpler and perhaps more familiar gambler's cop. You cop the bottom card slightly back from the front of the deck and perform your bottom deal (I use strike method one or one of the variations) as normal. 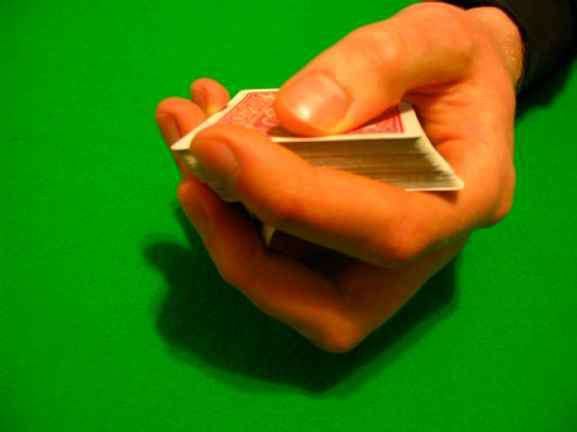 Unfortunately, you need to watch your angles very carefully while performing this deal since the bottom card often protrudes out of the back of the deck quite far. 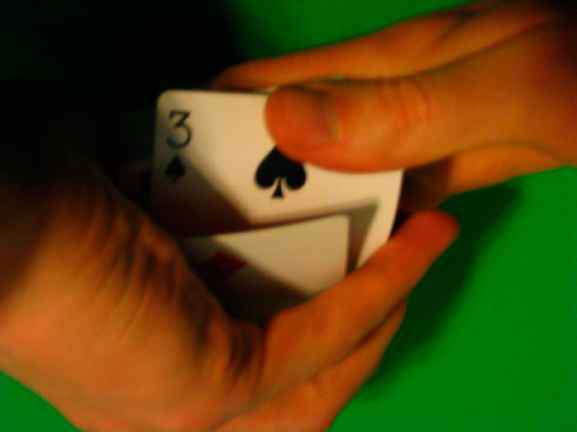 This subject addresses dealing off the third, fourth and fifth cards from the bottom of the deck. While the applications are limited, Marlo makes use of the method in a couple tricks and so for those who care enough to learn, the possibility for a use is present. In reality, the technical differences between the minus one bottom deal (Greek deal) and multiple minus are insignificant since basically it involves simply buckling, palming, pulling down, or coping more cards. Note however, that the pre-emptive methods wouldn't be applicable in the applications Marlo was using, in fact I'd doubt if there were any applications for those methods in so far as they concern a multiple minus bottom deal. This brings us ahead to the subject of stud Greeks and ultimately, stud multiple minus deals. Ironically, this deal is actually easier in my opinion than the bottom deal when it comes to the strike stud method one. Applications are I suppose present, though also limited. Again, it may help you to buckle the card second from bottom prior to the take in order to make it clean; using a newer deck of cards is also a nice option when possible. I'll not describe this deal in any more particular detail as you've been presented with all the components. The take is exactly the same as that in the comparable bottom deal with the exception of the fact that you must concern yourself slightly with noise. Though I don't find it's a major concern, it is easiest to cover with other noise since eliminating the sound in this case is all but impossible. There is a great debate over whether one should employ a push-off bottom or a strike bottom. Having examined each of them, I find that generally, I recommend a strike bottom simply for dealing ease and flow, but this is not an assured point. One of the apparent advantages of a push-off bottom lies in the ability to perform a clean take. However, having dealt cards with old decks, new deck and plastic decks, I've found that a clean take is not always assure with a push-off bottom deal. Thus, I turn to other questions, such a tip-offs. Which deals have the least tip offs? Again, there is no clear answer to distinguish between the push-off and the strike bottom deal, they have different tip offs, though generally I would say the strike bottom has fewer, though this brings me to my next point. Guy Hollingworth examined the subject to a small extent in his book "Drawing Room Deceptions" (I've said it before, I'll say it again, if you're a magician go buy a copy of this book, it's the best investment in a card book you're likely to make) and ultimately stated he settled on a strike bottom due to concerns of knuckle flash on push-off bottoms. However, he also added that this decision didn't sit well with him, in his case the concerns lay in the ability to perform a one handed deal from the same grip and the ability to perform a clean take. Now personally, I don't really find either of these points of major concern, I'm much more interested in the ability to perform all two handed deals from the same grip. His remarks led to an interesting conclusion however, namely a push-off bottom technique that had no knuckle flash and for those interested, I would recommend it fairly highly, I feel it deserves a slightly better explanation that he gives, but it is a superb concept. For now, I use primarily strike bottoms, but I also employ the Count's grip primarily and perhaps you'll share the enthusiasm with me when we finally reach that point of this volume. Ultimately, for each individual, I'd advise you examine what deals you'll need, then find the best grip for accommodating those deals collectively. Individual needs lead to individual solutions, such is the case here; such will continue to be the case for the foreseeable future.